Sucker Punch's inFAMOUS has an unexpectedly earth-shattering "start" button. Literally. Other start sequences pale by comparison. They load looping feature demos or narrative clips that play like movie trailers without the thunder-throated Don LaFontaine voiceover. Not inFAMOUS. Its initial visual could be a webcam nestled somewhere in a city park at dusk. Street lamps glow serenely between gently rocking trees. Distant city buildings stand in reposeful silhouette. Even the electric billboards seem muted, pulsing reassuringly as off camera, children play and shout over composer Jim Dooley's mild, harp-touched orchestral pastiche. Then you tap "start," and everything explodes. No "New Game?" or "Options" menu items. No "Loading..." or other introductory rigamarole. Just the startling immediacy of blue-black electricity-baptized mayhem soundtracked by panicked cries and screams. It made me think of the Hatch button in ABC's Lost, except without the timer, and instead of saving the world from a catastrophic electromagnetic event, pushing the button condemns it to one. It's a hell of a way to lead, and if you're wondering whether the fact that you're the finger on the trigger matters: Yes, it does. Like Lost, inFAMOUS steeps its subsequently grim and grimmer narrative in half-truth and misdirection. Your name is Cole. 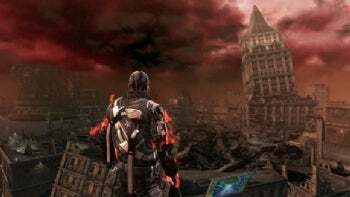 You've survived the cataclysmic blast that's devastated most of a metropolis spread across three islands, emerging with only a few singe marks and scrapes from the explosion's epicenter. You hear voices. Your girlfriend hates you. Your best friend sounds like Horatio Sanz with the comportment of fat Elvis. And for some reason, you've become a walking, growling, stubble-headed plasma globe — part shave-it-like-Beckham, part emphysemic Electro. Into the wreckage of the city then, first on foot, later by scrambling between rooftops, and eventually by venting arcing tendrils of electricity that let you glide through descents instead of plummeting to the ground. Not that you need to be concerned about heights, given that Cole can leap off anything and land unscathed in a stylish crouch that's kind of like the fetal pose adopted by Arnold when he first arrives in Terminator 2. Since the government won't step in and has the city cordoned off (echoes of DC's "No Man's Land") it's up to you to stand up. You certainly come equipped for the job. Bullets don't bounce off you, but you can take a pounding, and when the danger's past, you'll heal up automatically. 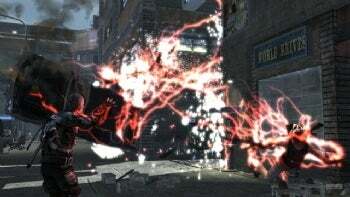 Instead of firing guns, you issue blasts of electricity from your fingers, accreting new abilities like shock pulses and plasma shields as the story progresses. It's a superhero game, in other words, though of the sort echoed in comics like Robert Venditti's bleak-soaked The Surrogates and films like M. Night Shyamalan's brooding Unbreakable. Where did the bomb come from? Why did Cole survive? Where did he get his powers? Why does his girlfriend hate him? Over the course of the game, you're contacted by several people who claim to know what's happened and why. But who to trust? It's a question with potent consequences in inFAMOUS. While the game's ending is fixed, your moral choices — tracked on a karmic half-dial with blue for "good" and red for "evil" (an obvious Star Wars homage) — alter the logistics of your journey. Play a good character and you'll have access to only good power upgrades, which transforms how you approach tactical situations. Or complete an area's "evil" missions and the "good" alternatives are permanently locked away, missions with distinct and often fascinating itineraries. Just walking down the street has cumulative ramifications. Do you heal wounded passerby? Bind them in electric shackles? Or replenish your energy stores by bleeding their life away? Every choice is a mounting commitment. Unlocking one path seals of another. Incidentally, several "good" acts require that you stand aside and passively allow an event to occur. That's risky business. Conventional game design defines "choice" as something you do, not something you allow. 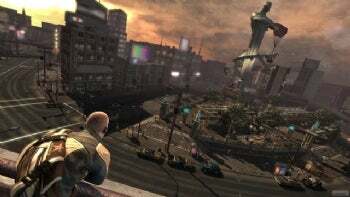 In one of inFAMOUS's initial karmic tossups, you can either choose to shoot a bunch of starving civilians and ensure more food supplies for your friends (evil), or let those civilians take their share of the food (good). It's a subtle but powerful moment. How many players will balk at not acting, then act less than scrupulously, if only to revel in their godlike powers?